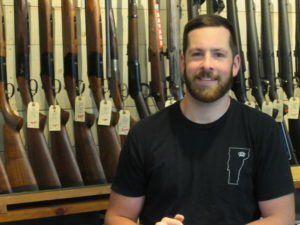 Theodore Benoit, owner of Lead and Tackle Co. in Lyndonville, recently opened the sporting goods store at the 31 Middle Street location after attending nearby Lyndon State College, where he focused his education on business. “I am passionate about the industries I am in and ready to take on the challenges of a small business using my prior experience in retail and business education,” Benoit said. “There was a huge void left in the community and it seemed like the perfect scenario for me to get started,” he said. Even though Benoit had experience and a good local education, he took advantage of additional resources by choosing to utilize the help of Vermont Small Business Development Center Area Advisor Ross Hart, “to have someone with great business knowledge and instincts on the outside looking in asking me questions and giving me insight on steps to take and things to consider as I moved along,” he said. For more information about Lead and Tackle Co. check out www.facebook.com/LeadTackleCo and for more information about VtSBDC and the services provided by area advisors check out www.vtsbdc.org.